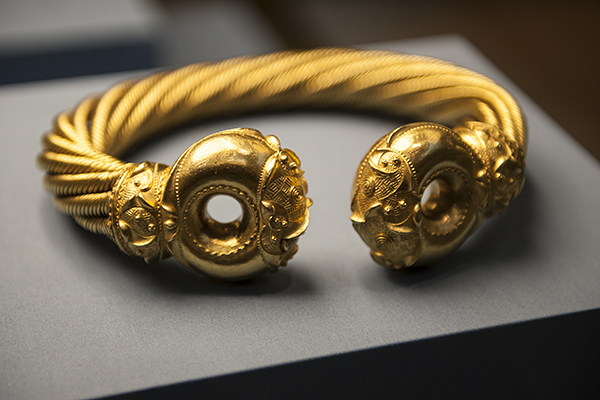 The golden necklet that Boudica wore may have been similar to the Snettisham Torc, which was found in the territory of the Iceni and dates to about 100 BC. Elaborately wrought from slightly more than a kilogram of electrum (an alloy of gold and silver), it is made of eight strands twisted together, each one comprised of eight wires, and secured by cast ring terminals. The resulting masterpiece is one of the most intricate works of art to survive from the ancient world. Now in the British Museum, the torc was discovered in 1950, together with two others and a bracelet, in a plowed field at Snettisham just a few miles from the west coast of Norfolk. A coin minted by the Atrebates caught in one of the strands suggests that the hoard may have been buried about 75 BC.